I figured I would start this thread for those of us just stating out with the Star Analysers 100 or 200s to share experiences and get advice from those more experienced. 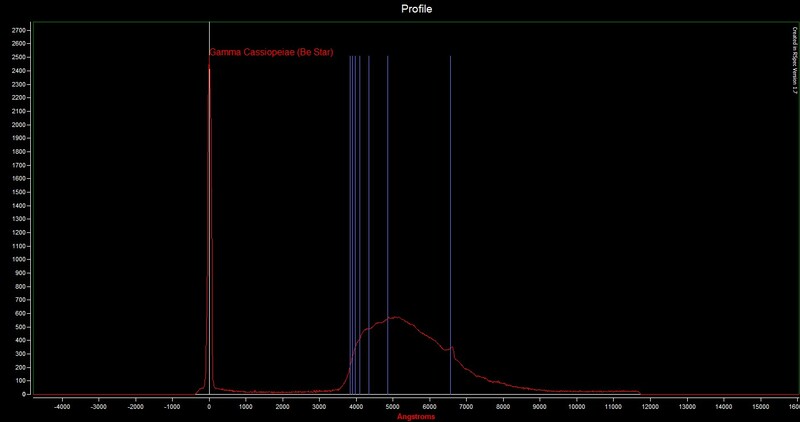 At first glance the spectra of Del Cas appeared pretty featureless, but even the spectra was bright with a 2 second exposure and the features were hidden. 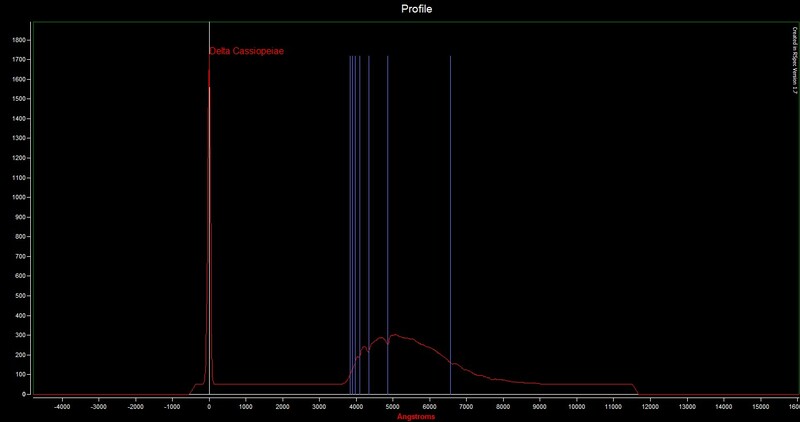 Right after taking the image I used the AIP4Win profile tool and with a tweak of the histogram it was easy to find the center of the spectra and the Balmer features were obvious. Then on to Gamma Cas. This star was very interesting. In the H Alpha the emission feature was very apparent. I would say these two stars are great choices for a first night out doing spectroscopy in the winter. I also was interest in Alnilam. The features on this star a more subtle and therefore more difficult to detect. Using the AIP4Win profile tool, no obvious features were detected. This morning I stacked images and used RSpec, the software that Jeff recommended to calibrate the pxl/wavelength relationship. I got 11.33 Angstroms per pixel. I believe 11.33 is within the recommended range and closer to the oversampled side. My guess is that is the best place to be.... I'd rather be closer to the oversampled side than close to the undersampled side? It that a good assumption? Using Rspec I was able to place Balmer indicator lines on the image. I have attached the jpegs to this message. You can see that the Balmer lines do not match up perfectly but are pretty close. It also appears that H Beta and H Delta may be present in the Alnilam spectra. On Alnilam the features are probably not far from the noise level of intensity, but the dips do appear on each of the eight 2 second exposures I made of Alnilam. PS If you want to see my FITS I can provide those for inspection as well. Great job! That is outstanding for a first try. My only comment is you are way under exposed. Typical summed first order spectrum profile column pixels is only around 2000 ADU, It should be around 200,000 to 500,000. By increasing the exposure your SNR will be better and you should be able to see features better. Note, I am talking about the first order spectrum, not the zero order (star image). Use RSpec and the pixel map (little matrix icon at upper left) to see what the peak ADUs are for the spectrum. Assuming you are using a16-bit camera they should be under 65,000 and ideally in the 40,000 to 50,000 ADU range. When pixel columns are summed that exposure will produce max profile ADU value in the hundreds of thousands. Great job for a first run, Andy. I suspect you can get sharper line features by being painstaking with focusing the spectrum. Use the zero-order star image to get thereabouts with focus. But then it's important to use one of the strong absorption lines to get focus as precise as possible. Try to get the line as tight and dark as possible. Note that this will slightly de-focus the zero-order star image: that's normal and to be expected. We had a clear sky last night. I did Gamma and Delta Cas per Robin's suggestion--same as CNY above (Sorry don't know your name). These are short exposures of about 1 second, so as not to saturate either the first order star image nor the spectra. I did have to stack 12 images of each to achieve the 200,000 to 500,000 adu's suggested. This gives an SNR of 2540 for the zero order star. BTW: Make sure you are processing in 32 bit--I was not initially and the plots in RSpec came out with much lower numbers. Tom helped find the Tools>Options>Advanced window to set this. It was not set in my demo software. First I want to make sure you understand that the star image is the zero order spectrum and it can be saturated as its sole purpose is to provide a wavelength reference. As such, DO NOT look at the ADU counts for the zero order/star image. Do not worry about what the peak counts for the zero order profile are. What is important is what the maximum pixels ADU counts are for the first order spectrum. This is why using the pixel map is important. (The pixel map is the little matrix icon at the left side of RSpec at the top, the fourth/middle icon) Again, you do not care what the ADU counts are for the zero order or star image, only for the first order spectrum. Note, there are higher order spectra too, second, third..., but you only want to work with the first order spectrum as it will be the brightest. Note also with the Star Analyser there will be spectra on both sides of the zero order, but because the grating is blazed, one side will produce a first order spectrum brighter than the first order spectrum on the other side. Use the brighter one. I suspect your first order spectrum is under exposed. The maximum pixel ADU counts for the first order spectrum should be in the 40,000 to 50,000 range and when the profile is created the first order spectrum profile should be in the several hundred thousand ADU counts. Again, it does not matter what the zero order/star image counts are. Also, I find little value in stacking. Just determine the correct exposure to get the ideal counts and use that. Thanks for the comments. The reason that I tried not to saturate the first order star image, is that with the two point calibration, using the zero order star image as one point, I would think that a badly saturated star image would make it hard to find the center. This is why I did not saturate the first order star. How do you find the center of a badly saturated star image? A second comment, is that the original fits images for these plots were running about 45,000 to 50,000 adu's per exposure, and its a 16 bit camera. So there is a little left before worrying about non linearity, but not too much. When I stacked and opened them in RSpec, and looked at them with the pixel map, the largest was 631,000, as a 32 bit image, and it was the result of 12 images stacked. So that is the reason I stacked them. Is there a downside to stacking? It seems like this is the way to get a nice unsaturated zero order star image and lots of signal in the first order spectrum. To find the center of a line use the Barycenter. Use the two measure lines of RSpec and bracket the line. The software will find the center for you. Again DO NOT worry about saturating the zero order spectrum. Also, the resolution of the Star Analyser is very low so precise wavelength calibration is not a big issue. When you say the fits images were running 45000 to 50,000 ADU counts, where are you measuring, deep into the first order spectrum? The comment about the pixel map showing 631,000 is strange. In your images, the maximum summed columns in the profile for the first order spectrum are only 200,000 so how could any pixel be greater than the sum of the column? Something is wrong with what you are doing. Thanks for the tip on the Barycenter. That works very nice. It gives one more decimal of precision, not sure if the accuracy is any better. Of course, I hope that the algorithm is still correct when saturated values are used. I may give that a try if it stays clear tonight. Some algorithms do not respond well when the input is non linear (ie saturated). As for the adu's, I think you skipped a digit. My plot shows 20000000, ie 2 million, not 200,000. I had to look several times to make sure, its hard to see. So the first order spectrum looks fine to me when the 12 images are stacked and the colums are plotted in RSpec. Indeed I did read the numbers wrong. I think you have gone way overboard in the other direction. Thanks for sending me the fits files. I have a couple of comments. The images needed to be rotated 1.75 degrees. No problem, but it is best to get the spectrum horizontal during the exposure. As I recall from astro-imaging stacking was used to reduce noise of an image and thus produce a clearer image. There are two types of stacking, averaging and summing. The averaging was what was used to reduce the noise. Summing never seemed to help much. It seems you are doing summing. The spectrum profile that you produced has extremely high ADU counts. However, the profile does not seem to show much. The whole point of this is to produce a spectrum line profile that shows good features, mainly well defined lines. I invite you to do an experiment. Use just one of the images that you stacked and produce a line profile. Compare it to the one from the stacked image. See if there is any improvement or actually some degradation of the profile. I suspect you will be better off with just one image. Also check the pixel map for the one image and make sure the max pixel ADU counts are in the 40,000 to 50,000 range. 1. The original images do have approximately 2.5 degrees of rotation, caused by the grating installation. One of the great features of RSpec is the rotation tool. It allows one to do this adjustment in software, where it is far easier than to do this at the telescope, taking the filter wheel apart each time. I am not aware of any issues with using the rotate tool in RSpec for the SA200 grating. 2. As for summing or stacking, there is no difference. In the average case, you sum a number of images and then divide by the number of images to get the average. The sum is calculate first. So the actual numbers will be different, but the SNR will improve by the square root of the number of images, as long as you are not read noise limited. Remember, that when adding, the signals add directly and the noise adds in quadrature. 3. I did do the line profile for a single image and the stack of 12 images. Its clear that there is more detail in the stack, and the definition of the features, like Hb are more defined in the stack. Click the ruler on the top tool bar to show the measure lines panel at the bottom of the screen. This will display two vertical "measure lines" on the graph. (If you've zoomed far in, they may not be visible except as a thin dashed yellow line on the left or right margin. If I haven't had too much coffee yet in the day, I can usually click and grab them to drag them into view.) :-) Drag the measure lines so they bracket the zero order. The software will display (see attached image) the pixel value of the barycenter of the data between the yellow measure lines. You can manually type that pixel value into the calibration window, or just click on the pixel value so that the the software transfers it to the current pixel field in the calibration window. To help get the measure lines symetrically positioned around the zero order: If you hold the Ctrl key down while dragging one measure line, when you let go of the mouse button, the other measure line will "snap" to the same y-value symetrically opposite of your feature. I've been using the SA100 for a couple of years now. A simple trick I do when I want to ensure my spectrum is sufficiently exposed is to temporarily move the zero order image off the CCD, and then set my exposure time so the displayed histogram more accurately reflects that of the spectrum. This doesn't always work if, for example, there are other bright stars in the fov. More often than not though, my fov is such I generally have very few bright stars in the image. If I can't eliminate bright stars that saturate my histogram, then I take some test images at different exposures and check the ADU values of the spectrum using a program such as Meade's Image Processor. It adds more time to the session, but the results are worth the effort. Now that I think about it, I believe RSpec also allows you to check the ADU's of the spectrum, saving a bit of time. A second thing concerns focus. RSpec allows you to view your spectrum in real time, which is really helpful for focusing. Even though RSpec has a focusing tool, I have found it easier to instruct RSpec to display my spectrum as soon as it is downloaded from the camera. I then focus, usually on either Hbeta or Halpha. When the desired line seems to be at its deepest, that's where I leave my focus. When the spectrum is properly focused, the zero order star may start looking a bit like a tiny donut. The third habit I developed is to always obtain the spectrum of a nearby A star (usually within a degree or two) for focus and calibration purpose. The images of that star is then always saved along with my stars of interest. Doing that allows me to go back at a later date and recheck/confirm calibration results. 1. I used the grating backwards, with the threaded end toward the sky. How does this affect its performance? Presumably the blazing may not be designed for this orientation. 2. I tilted the grating 7 degrees to the camera, so it is directly facing the star. How does this affect the performance, relative to a grating square to the camera and angled 7 degrees to the star? Surely the blazing is intended for a specific light direction. Should I have the grating square with the camera, or should I split the difference and tilt it 3.5 degrees? 3. There is a lot of ripple on the spectrum, I assume caused by some interference with the pixel gate structure, microlenses, etc. Are some camera sensors better than others at minimizimg this ripple? I've never actually tried with the grating reversed, but I don't think it would make a significant difference. Inclining the grating on an objective set-up is probably a good idea. I use a similar arrangement with an objective prism. Your underlying spectrum looks pretty good. I have seen similar "ripples" on the peak area of a spectrum when the exposure "tops out" at the end of the linear region of the camera response. More consistant (smaller) ripples can be generated as artifacts when the spectral image is sitting at an angle to the horizontal and tilt corrections applied. If you have rotation turned on, noise like that can also occur. I am glad to see that everyone is having fun taking spectra of their favorite star--then asking for feedback. If we all choose a different star, then we have no idea what to expect. When I first posted, Robin was kind enough to suggest Delta Cas. May I suggest that everyone do their favorite object, but do Delta Cas so that we can all compare on a common baseline. Do we need a southern common star? Those with experience, suggest one for us to standardize on for our sourthern observers. There is no need to angle the grating. The effect of angle on the blaze efficiency is small with transmission gratings. See the comment at the bottom of the page and an example of the problem in the processing section on the following page. The trick to minimising it is to align and stack many exposures, shifting the spectrum on the camera field slightly if the natural tracking errors are not enough to even out the pixel coverage. Is this a single image or a stack? I took a series of 5 images at each Fstop last night and averaged them. This gets more electrons without saturating any pixels. Exposures were 5 sec at F4, 10 sec at F5.6, and 20 sec at F8 and F11. Tracking was essentially perfect, since with a 50 mm lens, each 9 micron pixel is about 37 arc-sec square. The mount is an AP 1200, polar aligned within 1 arc-min of the refracted pole. My earlier pictures on Jan 16 had only 2 or 3 images averaged, depending on the Fstop, so the comparison may not be quite fair, but I don't think the ripple is reduced by longer exposures, unless there is some blurring due to mistracking or poor seeing. The reason I ask, is that about a week ago, I inadvertantly stacked 24 images of Delta Cas using "auto-star matching" instead of "one star integral pixel" option, While the result was not the ripple your are seeing, it did increase the noise between major features. It was easily removed on a stack that was stacked the proper way that is reccommended for photometry. The problem with some of these other algorithms, is that they resample the image and strange effects can occur. Just a thought. With slit spectrographs,using a flat is the key to getting rid of them but this does not work with slitless spectra unfortunately so you have to try to include them into your instrument response which can be tricky. Ken's observation about keeping well away from saturation is an interesting one and something to try to see if this reduces their intensity. Thanks for the responses to my questions. Regarding possible explanations for the ripple, the spectrum was well within the linear region of the camera, which is at least 62K ADUs for the ST402. The spectrum was accurately aligned with the pixel rows, no more than 1 pixel slant over the entire length. I tried processing with rotation turned off, but it had no effect on the ripple. I looked over the links provided by Robin, and it seems that the problem is mainly with Kodak sensors with microlenses. I have 2 CCD cameras, but both have Kodak KAF sensors with microlenses. Last night I tried again, same setup but with the spectrum aligned with the columns of the sensor. I was able to get most of the spectrum in this shorter dimension, all but the region beyond 8000 A. The ripple is reduced to about 60% of what it had been; the wavelengths at the peaks are unchanged. It is possible that some effect like poorer focus was responsible, but this is not obvious in the pictures. Earlier I noticed that the ripple was lower at wider Fstops, particularly F4, where it was about 60% of that at F11, but the resolution is also a little worse at F4. So I repeated all the Fstops last night, and the found that the improvement at F4 adds to the improvement due (apparently) to the alignment of the spectrum with the columns. The spectrum is very narrow, with one pixel row or column having most of the light. The next clear night I will try widening the spectrum by running the drive at a different rate with the spectrum aligned north to south. I will also try placing spectrum diagonally. Ripple like that is primarily due to the coarse sampling of your 50mm camera lens. At 37arcsec/pix, if you are focused, all of the starlight falls on one pixel. The resolution of a grating is dependent on the seeing disk of the star, both in the vertical (spatial) and horizontal (dispersion) directions. If you are undersampled, you start seeing the QE substructure of a pixel. You should try to defocus until you have 1.5-2.0pix fwhm on your star images. Note that changing from f/4 to f/11 or any other f-stop doesn't change the pixel scale, so you will still be undersampling. I also question your statement that your ST402 is linear to 62K ADU. I think you should confirm this with a linearity test, as I have yet to see an ST402 that was linear at that range. I think you are saturating as well as undersampling. Try to keep the peak ADU in the 40K range, with some defocus, and see what you get then. In this case on the evidence so far my money is on the spectral response of the camera as the cause. but the definitive test in my post above should allow the cause to be determined. I aligned the spectrum horizontally (north-south) and let it drift east-west by using the 1.25x sidereal guide rate. The result was a more consistent set of ripples and slightly less high frequency noise. With a narrow spectrum without drift, the ripple amplitude varied with exactly where on the pixel the spectrum was centered. Attached is a jpeg of the drifted spectrum. The ripples are obvious, but faint compared to the Balmer lines. In every case the ripple peaks have the same wavelength. I also tried a diagonal spectrum, with very poor results - lots of high frequency noise on the Rspec profile. It looks to me as if you're getting fringeing from the CCD cover plate. Does this effect happen for all ST-402's with SA-200, or only some? Do microlensed chips have a cover plate? Unfortunately I dont have a cure to suggest, though they do seem more severe and finer in scale than I have seen before even with similar sensors. Are you planning to try the grating in the converging beam between telescope and camera? Because they are such a relatively fine scale, I expect the reduced resolution due to the large star image may reduce the intensity of the ripples to a degree. If they cannot be reduced then a careful instrument response correction curve including the finges will be needed to remove them. I tested the linearity and measured the gain of my ST402 shortly after I got it many years ago, using the method in Berry and Burnell's book. The gain was 1.475 electrons per ADU, consistent with the specs of 1.47 and 1.50 in various SBIG documents. There was no sign of nonlinear response up to 62K ADUs, my highest test point. This is as expected, given the advertised full well capacity of 100K electrons, or 67K ADUs at the measured gain. For my more recently acquired ST8, I measured a gain of 2.75 electrons per ADU (SBIG spec is 2.30), and linear to only 36K ADUs, or 99K electrons at the measured gain, again about as expected. Maybe you were thinking of the ST7, which has the same sensor as the ST402, but is otherwise identical to the ST8. Either cause is possible in this particular case but it is easy to distinguish between ripple caused by variations in spectral response from that due to spacial effects such as poor sampling or rotation artifacts. If it is due to variations in spectral reponse they will always be at the same wavelength, independent of the observation conditions, dispersion etc. If they are pixellation effects they will vary (in position and intensity) from exposure to exposure depending on postion of the spectrum, orientation, focus etc. You re probably right - I had forgotten that SBIG set up the gain differently for the ST-402 than for their other ST/STL cameras. Thanks! I wonder if this may be something similar? but is normally limited to thinned, back illuminated CCD in the NIR though where the silicon becomes more transparent so I am not sure of the mechanism here. Rechecking your setup, are you still running with the grating at an angle? Also you mentioned an additional clear filter in the imaging chain. Can you set the grating square to the lens objective and remove the clear filter just to check these are not giving a problem. When I first tried the grating in late December, I imaged Vega with a 40mm lens at F4, before I built the tilted adapter. I just checked the images with Rspec, and find that the ripples are there at the same wavelengths. The Clear filter is not removable from the ST402 camera, as it is part of the shutter, and glued in place. I could buy a plain shutter to replace the current filter wheel / shutter combo, but I doubt it would help. I also noted that when using the B filter instead of the Clear one, ripples are still there at the same wavelengths. These filters are the same thickness, but probably not precisely so. The B filter is not colored glass, but has interference type coatings. I plan to eventually use the grating with a telescope and filter wheel (SBIG CFW9 with ST8-XME camera), but wanted to try it out in front of a lens first, where it is much easier to adjust. Also I got a somewhat fuzzy spectrum of Comet Lovejoy, which I assume would not be possible with a telescope. This would consistent with the absence of ripples in a flat with a KAF 1602E sensor compared with strong ripples in the same spectrograph but using a KAF 1603ME sensor as seen in the comparison at the top of Benji Mauclaire's page here. Interesting investigation - thanks for your efforts, Robin, and the links to the cover glass phenomena! A 12-micron layer is strange, as I am not sure on which surface such a layer would reside. There are AR coatings on the grating, and I think there is an AR coating on the clear filter in the ST402, but they are designed to not reflect. John, why did you tilt the grating? This is the one feature that is different from any other user. Can you remove the tilting and try again, so that we are comparing something more like apples vs. apples? As I noted in my reply on Jan 26, I first tried the grating without the tilt, and got the same ripples. The 7 degree tilt I used faces the grating squarely to the star, while the grating output enters the camera lens squarely, at least in the center. This seems to me to be the proper way to use a grating, although it will not be practical to have it tilted in the filter wheel. I was also concerned about the blazing not working optimally if the grating is not facing the star. Regarding the 12 micron dimension, I think Robin is saying that this is the spacing between the bottom surface of the microlenses and the top surface of the silicon chip. I dont know for a fact that the gap between microlenses and the sensor surface is the source but adding microlenses, as in the difference between KAF1602E and KAF1603ME does seem to have generated ripples where there were none as Mauclaire's flats with a LHIRES spectrograph running at low resolution using a 150l/mm grating show. This would potentially be a big improvement on my existing camera which has the ICX285 sensor but I have no plans to upgrade until the ripple performance is clarified. I can't comment on specific camera/ CCD's - my knowledge comes from experiences in solar imaging, where the monochromatic (Ha) light can aggravate the situation. Howell in "Handbook of CCD Astronomy" p 83> taks about the fringes (Newton Rings) "are caused by interference between light waves that reflect within the CCD......"
Tilting the grating reduces the astigmatism ( which doesn't affect the dispersion or resolution) which can broaden the height of the spectral image. The benefit may come from presenting the spectral image "on axis" and thereby reducing the change in focus between the blue and red (normally seen in the "traditional" square mounting arrangement) - a marginal improvement. This refers to tilting a refection grating normal to the dispersion direction doesn't it? which is not the same as tilting a transmission grating in the dispersion direction. In any case John has already indicated that the ripples are seen identically in both configurations and is also seen when the spectrum is drifted into a wide band. EDIT:- or perhaps not. There seem to be two effects refered to, a reduction in astigmatism and a reduction in the effect of a tilted focal plane (neither of these are affected by tilting a transmission grating as far as I am aware though.) do you know what configuration is being refered to there ? 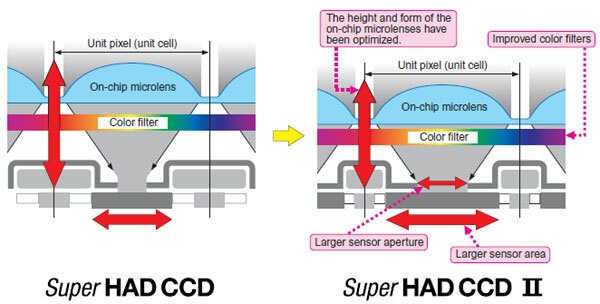 Although the indications are something in the something in the CCD structure is the cause, there is one more configuration difference I would like you to investigate if possible. You mentioned that the grating is installed reversed ie with the threaded portion towards the sky. Although the grating itself works the same in both directions and this has been tested in the usual configuration for the Star Analyser ie in the converging beam in front of the sensor, it has not to my knowledge been specifically tested in the objective grating configuration in the collimated beam in front of the camera lens. Tonight I tried the grating facing the "correct" direction, threaded end toward the camera. I could not use my tilted adapter, as this would put the grating far off center on the camera lens. So I used my original adapter, but the grating is now farther in front of the lens. The ripples are still there, at the same wavelengths and approximately the same amplitude. Since you have taken out the tilting arrangement, and have tried the grating in both orientations, my guess is that it has nothing to do with the grating itself. I also think it is less likely that the microlens spacing is the culprit, since I would assume most of the Kodak sensors would have similar spacing and I don't see any ripples in the ST8 images (KAF-1603me). My assumption would be something related to the clear filter. The cover glass in the Kodak KAF-0402me is about 1mm thick, and is spaced about 1mm above the sensor, so none of those dimensions match the 12 micron etaloning that Robin found. Some vendors remove the cover glass. The ST-402 filters are 1mm thick. The BVIc filters are dielectric; I don't know if the clear filter is AR-coated. Kodak doesn't give the microlens spacing above the sensor. We do have an ST-7XME camera, and an ST-402 camera, in the AAVSO lab. If it wasn't winter, I'd do a comparison test here at HQ to see if we get similar etaloning in our ST-402. Yes that is curious. They have definitely been seen clearly in various other low resolution spectroscopic flats taken using this sensor. It was the marked difference between spectroscopic flats taken at low resolution with the 1602E and 1603ME on the same spectrograph which Benji Mauclaire produced that alerted me to the possibility that the microlenses might be the cause. Perhaps there is a subtle interaction between the sensor and the precise geometry of the beam illuminating the CCD which causes them to appear at greater intensity under certain circumstances. This was found to be the case with the much finer ripples in high resolution spectra induced by the CCD cover glass. Small adjustments to the internal alignment and focussing of the spectrograph could have a significant effect on the ripple intensity and they would also sometimes appear more prominently in bands in different regions of the flat. The precise conditions and mechanism which produced this variation in intensity is still not understood though. It will be interesting to see in John's case if they appear less prominently with the Star Analyser and camera mounted on the telescope. QE ripples from KAF sensor microlenses - the smoking gun? 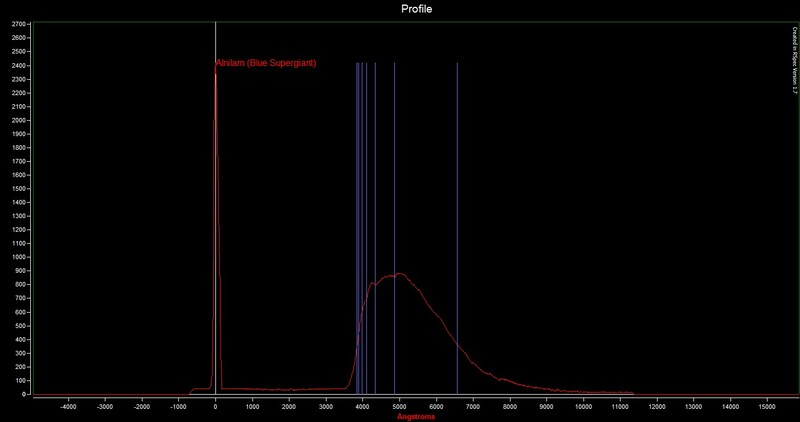 I had a look at the graph of the spectral response of the KAF0402E and ME in the Kodak datasheet (attached) . The ripples in the response around 640-720nm in the ME version are clear and correspond exactly in wavelength to the peaks of the ripples seen in John's SA200/ST402 spectrum. The ripples become confused towards the blue end in the Kodak graph but this is where they would be closer together so perhaps is an aliasing effect from insufficient spectral resolution in the Kodak measurement. I have been following the discussion about the waves in the spectra on this camera. I decided to pop mine open and look at what was inside. It has a simple shutter, with 4 openings, that are photometric. There is no filter wheel. I have the BVIC filter wheel, but never installed it. I have attached a pic. Perhaps John would like to remove his filter wheel, and try the shutter wheel, if his camera came with it. This would compare to a spectra with the clear glass filter installed. Slightly different focus, but a good test. I have not used this camera with the SA200, so don't know what I would get. Now that I have my SA200 properly spaced, not anxious to tear things down and try something else. Robin, your post of the qe vs wavelength above triggered an image in my mind. I had seen that behavior before. Did not know what it was. I have attached a plot taken with my ST 402 ME, which has no clear glass filter, just the PM shutter. This is the camera which I posted a pic of the shutter above. I was using this camera along with a DSS-7 to evaluate the light sources for a light box. I have dozens of pics with ripples in them--each taken of some light source. Attached is a plot of a Pelican Xenon flash light. Ripples clear. Yep that certainly looks like the same phenomenon - easily dealt with in slit spectrographs by dividing by a flat but more tricky if you want to remove them in spectra taken with slitless spectrographs. The pattern should be consistent for a given setup though so a template could be produced to divide the spectrum by. (which can be done as part of the process of correcting for instrument response using a relatively line free hot star) One potential difficulty is that that the spacing of the ripples is of the same order as the resolution of typical Star Analyser spectra so the intensity is likely to depend to some extent on the seeing (which affects the resolution). The template would therefore need to be scaled to match the ripple intensity. Thinking about it - The difference in severity between the ripples John is seeing compared with spectra produced on other systems is perhaps due to the higher resolution that the objective grating in front of the camer lens gives. Share a few FITS files for Star Analyser/Rspec evaluation? I'm considering the purchase of the Star Analyser and the Rspec program. I'd like to gain some experience in using the the program before I decide. Would anyone care to share a few FITS files. I'd like to understand how well I can resolve lines for star classification purposes. The more different stellar types the better. I assume that the header will have the the camera and binning used as well as the exposure time. Any question I don't know enough to ask would be welcome. Oh, and answers would be welcome too! My system= 12inch, STT 6303ME, FW-8STT self-guiding filter wheel, F5.4.